I couldn't wait to hand sew the binding to the back so I stitched it down by machine. I don't usually do this but as it will be a throw for myself, I didn't mind doing it. I just wanted to see what it was like after it was washed. Here it is after a wash and a gentle tumble dry. I LOVE it, all wrinkly and soft. I'm a happy bunny!! She chose 'Rosie' as her quilting pattern. Well, that's me done for today. Just off to the post office to send 2 quilts back to their owners. It would be a perfect quilt to use up all those scraps you didn't use in your scrappy trips around the world quilt...... and I know hundreds of you made one of those!!!! Now I just have to start taking the pieces off the wall, row by row, and sew them together. I will have to do this fairly speedily as it is taking up my design wall and I can't use it for anything else until I have pieced it - it took ages just to place them in position so I am not going to take them off until they are ready to be sewn. I also quilted a small quilt for Jill today. That just about sums up my start to the week. This week I have quilted 3 quilts made by sisters, Helen and Caroline. All three are made from star blocks but using very different fabrics. Helen Made this quilt using prints and batiks in a green and pink colourway. 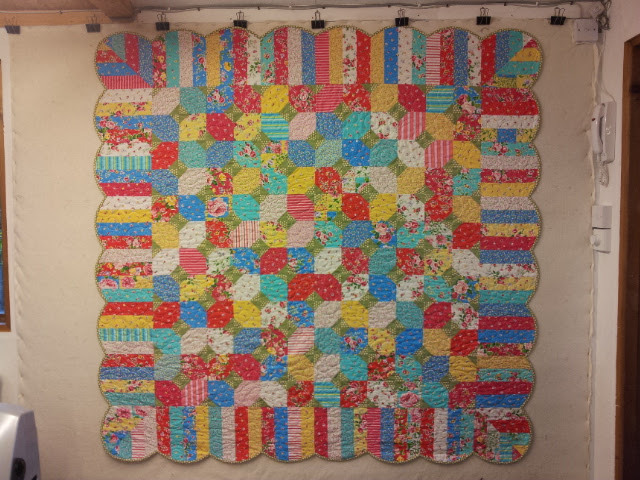 She chose the pattern 'swirling' to be quilted on her quilt. Star blocks are a very popular choice for quilts. I'm sure most of us have made at least 1 quilt in the past using stars. This is one I made about 15 years ago using Laura Ashley curtain fabric! I started to hand quilt it and never finished it until I got the Gammill. I unpicked the awful hand quilting and longarm quilted it instead. I love the look of handquilting but I'm afraid I don't have the patience!